Was the Gandhi family using Kamal Nath family’s business empire for routing kickback money from the main broker Michel? Gandhi family loyalist and Madhya Pradesh Chief Minister Kamal Nath’s family members links with AgustaWestland middleman Christian Michel is now completely exposed. Earlier agencies had found that Kamal Nath’s son Bakul Nath was harbouring and providing all help to Christian Michel who was hiding in Dubai. Now the Enforcement Directorate (ED) has made public that Kamal Nath’s nephew Ratul Puri is wanted in connection with the money trails in the AgustaWestland scam. Was the Gandhi family using Kamal Nath family’s business empire for routing kickback money from the main broker Michel? On Wednesday the ED revealed to the Court that they had questioned Ratul Puri many times and now wanted him specifically after the arrest of an arms agent Sushen Mohan Gupta. It is learned that Michel’s sub-agent Gupta, who is now in custody named Ratul Puri and the ED told Court that they wanted to confront him with Gupta. Ratul Puri is the son of Kamal Nath’s sister Nita Puri and Industrialist Deepak Puri, who is the promoter of many industries including Moser Baer, Hindustan Power Projects, etc, where both wife Nita and son Ratul are Directors. Bakul Nath was the key person who arranged interviews of Christian Michel to TV channels in mid-2016 in an attempt to provide a clean chit to Sonia Gandhi. The agencies were aware that Kamal Nath’s son Bakul Nath was in regular touch with Christian Michel who was in hiding in Dubai till December 2018. Bakul Nath was providing all support to Christian Michel in Dubai. 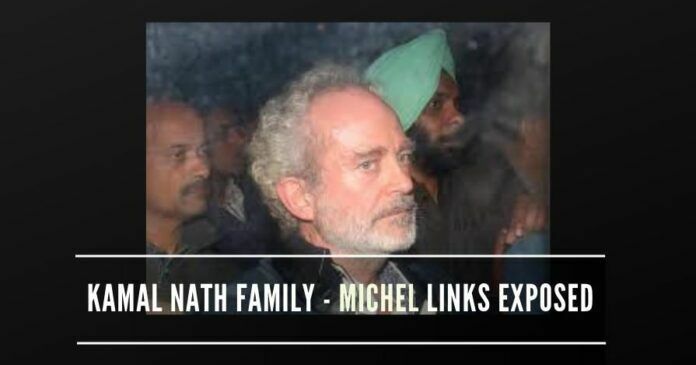 The Central Bureau of Investigation (CBI) and ED officers who met Christian Michel in 2016 and 2017 in Dubai had reported Bakul Nath’s role in protection and providing all sorts of help to the fugitive under the instructions of top leaders involved in the AgustaWestland scam. The Congress leadership was so much worried that Prime Minister Narendra Modi and National Security Advisor Ajit Doval from 2015 had started talks with the Dubai administration for deportation of Christian Michel to India. Bakul Nath was the key person who arranged interviews of Christian Michel to TV channels in mid-2016 in an attempt to provide a clean chit to Sonia Gandhi. India Today and Times Now journalists were co-coordinated by Bakul Nath to air the interview of Michel to provide a clean chit to Sonia Gandhi when Parliament was rocked with the Agusta scam, exposing the role of Sonia Gandhi. Bakul Nath is running a big education institution in Dubai. The Congress leadership was using this as a cover to maintain their links with Christian Michel, who was cornered by the Government of India from 2015 onwards. Now with ED revealing the role of Ratul Puri in the money trail, the role of Kamal Nath’s family members’ strong links are exposed in routing money from Michel. Ratul Puri is an international fraud. He runs a business of setting up solar projects in many forign countries for laundrying money to his Dubai companies. He is support by two key persons Lalit Jain and Rajeev Agarwal to route profits from solar business and laundry it with political money in Dubai. Modiji has exposed all this scam. Hope Ratul Puri passport is taken away and he along with 2 people in company spend long time behind abrs. Anupam- enjoyed your expressive thoughts. Congress party will- over time – become a past political operation – disintegrated by its own implosion. another form may appear- it remains to be seen. it is rotten to the core- and it is rotting progressively. as the leading charecters in that party turn to dust- it will diminish. Democracy to flourish we need a opposition- in center stage. in the mean time- we have to fight evil forces in and outside our borders- there is axis of evil- and it runs through the the Congress party.we have to enable the destruction of that party- and we have to go about in a smart clever fashion. Keep chasing & bring out more skeletons…..